The TI-84 Plus Silver Edition can be personalized by colorful interchangeable faceplates and slide cases. 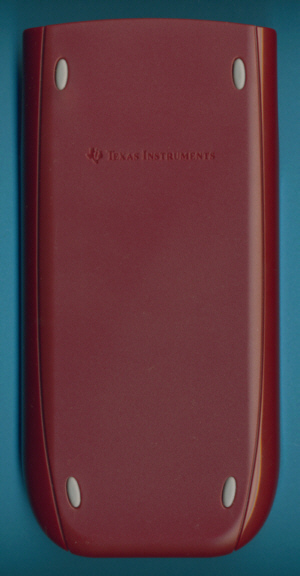 The slide cases fit the new TI-73 Explorer (2009), TI-84 Plus, or TI-89 Titanium, too. A different approach of customization was developed with the GraphiTI stickers available exclusively for the TI-Nspire and TI-Nspire CAS handhelds, TI-84 Plus Silver Edition, TI-84 Plus, and TI-89 Titanium graphing calculators. Adhesive, easy-to-print overlay stickers are available on the Texas Instruments Education Technology Store for $1.99 (10-pack as of 3/3/2009) and free software allows to download photos and clip art, add colors and stamps, or use pen and paint tools to create unique artwork. The success of the TI-84 Plus Silver Edition convinced even third-party manufacturers to sell their own "Designer Faceplate & Holster" products. Don't miss the TI-84 Plus CE introduced in 2015 and available in multiple colors. © Joerg Woerner, March 3, 2009. No reprints without written permission.